I can polish, repair and restore sterling silver and brass menorahs. Send me photos and let me know what you need to be done. A frequent request is to replace a shamash that is lost. While I can make anything, there are no replacement parts. We would be talking about a custom made one-of-a-kind part to remake a missing shamash. This sterling silver Menorah arrived for repair and polishing. The arms would no longer sit on top and were held in place with white first-aid tape. It was originally purchased in Israel in the mid-20th century. The customer wanted the arms to firmly sit on top, but be easy to disassemble for polishing without needing special tools. Watch this video to see this innovative repair that avoided altering the original menorah and satisfied the customers expectations. After the repair the lacquer was removed from the candlestick, and the menorah was polished. It turned out amazing. Sterling silver menorah (left) is mid-20th century from Israel. The upper portion is cast which is fragile. The cups and base are spun. It was polished carefully with 1" buffing wheels to avoid catching the curly design. This vintage mid-20th century Chanukah Menorah was missing a candle cup for the shamash. The challenge was to make a new candle cup that matched both the shape and the aesthetic of the original menorah. 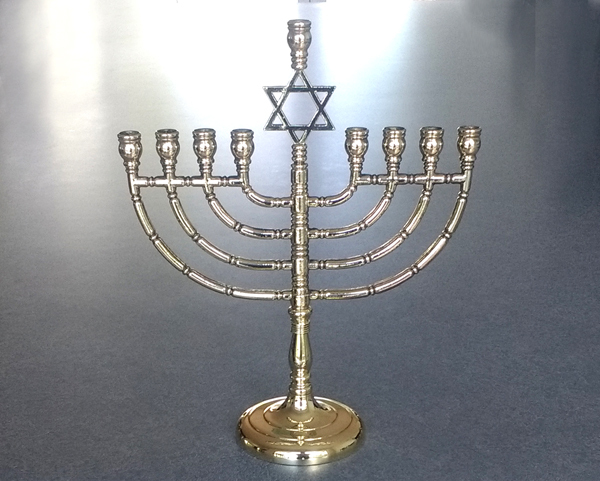 An additional concern was to avoid damaging the oxidized patina and original finish on the rest of this menorah constructed from sterling silver, brass and copper. All of these menorahs are cast brass from the mid-20th century. After they were repaired they were polished to restore their appearance.